Delicious on canapes. Ideal as a dip for crudites.Great brushed on meat before cooking. Makes a tasty omelette. 80g Jar. 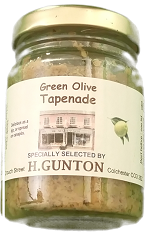 Ingredients: Green Olives 56%, olive oil, chestnuts 7%, anchovy cream (FISH) (anchovies (FISH), olive oil, vinegar, salt, spices), cep mushrooms 5%, wine (SULPHITES), pickled capers, sugar, garlic, pepper, herbs, spices. 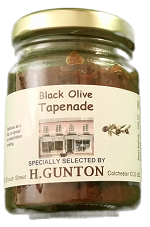 Ingredients: black olives 40%, tomatoes 33%, onions 13%, wine, olive oil, MUSTARD (water, MUSTARD grains, vinegar, salt, preservative: sodium bi sulphite(SULPHITE), pickled capers, herbs, spices. 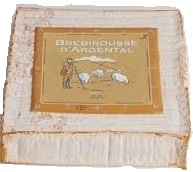 Creamed Roquefort cheese. 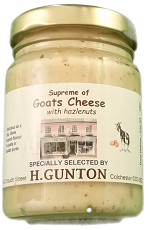 Great on hot toast or canapes. 80g jar. 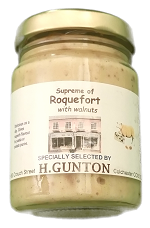 Ingredients: Fresh cream (MILK), Roquefort cheese (MILK) 27%, EGG whites, olive oil, WALNUTS 7%, pepper, Xanthan gum. Creamed goats cheese with hazelnuts. Great on hot toast or canapes. 80g jar.